This month I’ve chosen a fun, quirky ecommerce site, Coolbugstuff.com about insects. Seth Prezant, founder and “bugmaster” (gotta love that title) at Cool Bug, LLC, explains he had an outside company assemble the website for him, and it has been in operation for almost five months. Unfortunately, the site gets effectively no traffic—an average of 37.5 visitors per day. Seth admits, “I am nowhere to be found on Google, but I seem to get most customers through MSN.” So let’s help Prezant supercharge his website traffic. After all, there’s only one place to go, and that’s up. A necessary prerequisite to good rankings in Google is getting indexed. 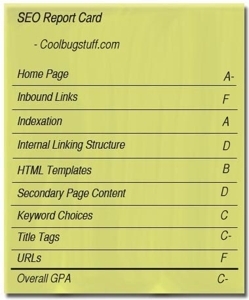 However, www.coolbugstuff.com’s indexation is quite minimal, a mere 59 pages, with all but a few in Google’s dreaded “Supplemental Index.” There are several reasons why they are not indexed well. One is that their link popularity and importance score (PageRank) are so low—a PageRank of 0 for the home page. Google isn’t reporting any back links to the home page, other than one internal page, which doesn’t bode well for Cool Bug Stuff. Microsoft Live Search (formerly MSN Search) reports only 18 links. This site needs some serious link building. Another reason for the poor indexing is the fact that the URLs have session IDs in them (at least for first-time visitors and those with cookies disabled, which includes search engine spiders). This is very bad from an SEO standpoint for reasons stated in my dynamic URLs article in the January issue of Practical eCommerce. In addition to dropping session IDs from the URLs, I recommend “rewriting” the URLs, through the use of a server plug-in like mod_rewrite or ISAPI Rewrite, and eliminating all stop characters (?, &, =) from the URLs for maximum spider-friendliness. For example, the category page URL coolbugstuff.com/stuff.php?capth=27 could be rewritten to coolbugstuff. com/category/27.html. There are two copies of the home page indexed in Google: one at www.coolbugstuff.com and one at coolbugstuff.com (both versions with a PageRank score of zero, unfortunately). Combining the two versions into one will aggregate the PageRanks together. Start by changing the URL on the links pointing to the home page from “/index.php” to “/“ — including the logo and the “Home” link in the top left, and the “Cool Bug LLC” link in the bottom footer. One of the links in the category navigation leads to a page containing no products. Pages like that are wasted opportunities. In fact, all the category pages would benefit from the addition of some keyword-rich intro copy. There are too many keywords in the meta keywords tag; I counted more than 250. That’s completely over the top; it looks very spammy. Cut it down to fewer than 20. They have a great start at “link bait:” a section for teachers, a section for parents, a monthly photo contest, bug recipes, ways that bugs are used in medicine and the Cool Bug Club which offers discounts, enewsletters and a free birthday gift. And because of the site’s unique niche topic area, further “link bait” opportunities abound, such as interviews with bug experts—people like David Bellamy and Rudd Kleinpaste—and well-known bug photographers. However, getting that link bait noticed for such an invisible site will require proactive measures like participating (i.e., commenting) on relevant blogs and online forums. Forum: good. Session IDs: bad. I was pleased to see that they have a discussion forum, but unfortunately it provides very little SEO benefit in its current form—with session IDs in the URLs and a minimal amount of activity (fewer than 50 posts in total). When getting a discussion forum off the ground, it is important to get to critical mass quite quickly. That means tapping all your friends, co-workers, customers and relatives on the shoulder asking them to do a quick burst of posting for a month or two. Also promote the latest posts in your email newsletter to stimulate activity. The site employs breadcrumb navigation, which is good. The title tags on the category pages are rather repetitive. For instance, “Cool Bug Stuff Cool Bug Books” is not a great title. A better one would be “Bug Books about Bugs and Insects at CoolBugStuff.com.” That has the word “bug,” in plural, as well as the synonym “insects;” it would also match on a search for the phrase “books about bugs.” The title tags of the articles are in better shape.